This beautiful little village is about 30km (20 miles) from Preuilly sur Claise, and has a number of walks along the clifftops and the surrounding countryside. There are a couple of antique shops and restaurants in the centre of the village. There is also a cave with rock art dating from 13,000BC, which is supposed to be to low relief carving what Lascaux is to painting. We haven't seen the cave, but it is now towards the top of our list. On nice summer's day it would be difficult to find a prettier place. Mind you, even in late September there was a fair number of tourists around. This photo was taken in September 2007. You can click on it to see it in all its splendor. We left Roux at 8.30am and called into La Roche Posay to buy breakfast at the boulangerie. We then progressed to Chatellerault, looking for a dechetterie to deposit our recycling at. Having filled the car at E. Leclerc in Chatellerault we took the reverse route to the one we had used coming down - Tours, Le Mans, Rouen, Boulogne. The only exception was an unplanned tour through the middle of Rouen at lunchtime. Arriving at Boulogne at 4.00 and with plenty of time before our 6.45 sailing, we filled the car with fuel again (it is 25% cheaper in France than in the UK) and did some shopping for the coming week. Luckily (although it did take some planning) we had bought an Esky (coolbox)with us, so we were able to buy milk and dairy goods as well. The terminal at Boulogne is a dreary place - not a good advertisment for Britain at all. The coffee is expensive (and rubbish ) and the surrounds are just totally motorway servies dull. 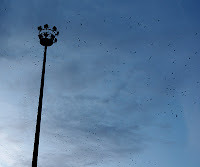 We entertained ourselves by watching the starlings roosting on a lighting pylon. 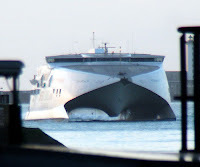 Eventually the boat arrived, and having parked the car we proceeded to the outside deck to watch France recede. The sky was mean and moody, but in the end the cold and rain drove us inside. Driving on the left hand side of the road in a left hand drive car one we arrived in Dover presented no great horrors. This was a relief, because I had fears it was all going to be too complicated for a tired brain. Having got all the doors open yesterday we decided that it was time to remove the rubbish left in the house. Susan had found a pile of tarpaulins and an old rug in the cupboard under the stairs which were holding a great lake of water. We shifted them (and a load of other stuff left lying around the house) and then completed the painting of the little storeroom. The room was a patchwork of colours and layers of paint before we started, so it will need another coat next time we go back. The kitchen, windows open but awaiting clearing. M.Galland the couvrier arrived to measure our gutter for replacing. Whereas every other French person has informed us that we have "beaucoup de travail" (just in case we hadn't noticed it for ourselves) M. Galland tells us a bird starts a nest with one twig. This is most reassuring! We don't feel quite so daunted by the amount of work in front of us when M.Galland seems unsurprised by what we are planning to do. We also cleared the remaining ivy and ferns that were growing out of the walls in the back garden. This has made a huge difference, and the house is starting to look a little cared for again. After we cleaned everything up and put everything away (and having hung a curtain in the storeroom) we re-screwed shut all the windows and doors returned to the gite to clean up in readiness for leaving back to London. Having received and printed the Certificat de Cession at the Library we hoped we now had all the documents needed to transfer the car into our names. This meant a trip back to Loches and the sous-prefecture. Miracle of miracles!! The paperwork was OK, and having relieved us of our cheque for 187Euros we were on our way. We don't have the new registration number yet (that will be posted to us). Maybe I should explain that; cars are registered within a department and show the department number on the numberplate, so that when the car changes department the registration number changes. Our car was last registered in Moselle (57) and we will be living in Indre et Loire (37) so we have to have a new numberplate made. This will all change in 2008. Having acheived so much on Sunday, we had decided to try paint the walls of a small storeroom that is at the end of the entry passage of the granary. We went to M. Bricolage (leClerc the supermarche's hardware store). There we not only bought paint and rollers, but we found a 120 litre heavy duty plastic storage bin. We decided that this would be perfect for storing sleeping bags and airbeds and the like, so we bought it and loaded it into the car (having rearraged the seating accordingly). We popped into LeClerc's to buy lunch stuff, then shot off home. Susan had been doing little practice drives around Boussay and Roux, and we decided that it was time she tried her driving on a more main road, so after Perusson she sat in the driver's seat and drove us for about 10km, managing not to cause any lasting damage to anything (psyches included). This is good, and we hope it's the start of sharing the driving. Arriving at Preuilly we opened all the windows and got stuck straight into the painting. It went quite well, even though our preparation left a lot to be desired. This paint job is just to brighten up a room to give us somewhere nice to take refuge, change into work clothes, rather than the final effort. Christophe from l'Image called around to look at the garden, because he said he would find us someone who could turn the garden over with a tractor. He agreed that it would work with a small tractor, and he would let us know. We then had lunch, finishing just before M.Bertucelli the plombier arrived. He had a look at the plumbing and agreed it was all a bit rubbish, and agreed to give us a quote (or devis - estimate) for installing a WC, and a cold water tap inside and ourside. We finished the paint before we finished the painting, so we drove into Yzeures to buy more paint and a curtain for the window, and then headed back to the gite. Sunday was going to be our day off, but after waking late and being a bit down because of lack of progress with anything in the house we decided to have lunch and do "something" to make us feel like the visit wasn't being entirely wasted. 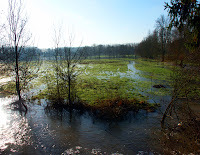 I have worked out a walk that takes a visitor around all the best parts of Preuilly. It isn't a long walk, but we have never actually done it ourselves. As our fun activity of the day we did the walk, which tends to work up and down the hill rather than across it. This may change in future, but for the moment this is what the walk looks like. After stopping for a coffee we went to the house to do some cleaning up. It really does need it, having not been cleaned for about 15 - 20 years. Although it is dirty, it's amazing how much grot WASN'T showing. Maybe Quentin Crisp was right "There is no need to do any housework at all. After the first four years the dirt doesn't get any worse". A decent sweep out and unscrewing the windows and shutters to let some air in made a huge difference to the feel inside the house. Most of the windows appear not to have been opened for many years, but I have been dosing them with WD40 over the last few visits in preparation for the event. Thus, they opened easily enough, and we started to get some fresh air in. Having satisfied the urge to "do" we went home via Chaumussay and I cooked petit sale for dinner, using what I could remember of a Hugh Fearnley Whittingstall (or Huge Ferny Whitteringbottom, as he is know by some - ok one - person in our house) recipe. As you can see, it doesn't take much remembering. After dinner we watched a political debate for the upcoming elections. Yet more "stuff" - with a saffron flavour. Preuilly sur Claise used to be a big saffron growing area, with an annual fair to celebrate the fact. For many years the fair has not been held, but last year it was revived. When we found out that it was being held again this year we thought we had better get ourselves down to the fair to support our local festivals. But first the stuff............. Having received a phone call on Friday evening to say that the required document for the car transfer had been emailed, we started off the day by joining the local library and its internet system. 12Euro each buys us 12 months of internet, restricted to 30 minutes and 5 sheets of printing a go. 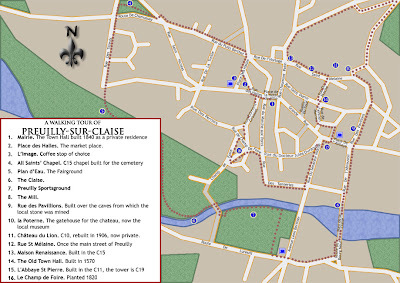 We printed the document and a route from mappy for getting back to Boulogne and departed. The Saffron festival was being held in the Salle des Fêtes, a new (I would guess mid 1980s) building with a small theatre upstairs. There were 4 saffron growers, a couple of the local wine, cheese and smallgoods producers, along with some chocolatiers, bakers and olive growers. The local archaeological association (they run the small museum in "la poterne") had a display, and it was a little gem of an event. We were most impressed, and bought 18 bottles of very nice wine (for 40 euros) from a man who seemed determined to get us drunk at 9.30am, a bottle of fine cold pressed olive oil, and tried various saffron flavoured chocolates. We recieved some help in understanding stuff from people we have met in Preuilly on previous visits - the lady from Hotel l'Image translated some stuff about basket weaving for us (did I forget to mention the basket maker before?) and it was all very friendly and pleasant. After lunch, which we had in the gite, we decided to head to the shops in Chatellerault to look for another tin trunk, or a metal office type cupboard. Neither of the Depot Vente (second hand shops) had them, so we took to the road to Poitiers, which is lined with hardware, furniture and shoe shops. On the way we saw signs pointing to a brocante (in Canberra that would be "Trash and Treasure"). Ever hopeful, we called in. The brocante was all clothes, books and bric a brac - sold by the kilo. I kid you not! 1Euro a kilo for books, of which we bought a couple, including the Readers Digest "Bricolage Complet", the how to do absolutely everything DIY in French book. No Cupboards though. It took 2 hours and goodness how many stores to find out that apparently the French don't do metal office furniture. It was most frustrating, and added on to Friday's events made me feel quite down. An interesting day, but it feels to me like we are going backwards on the house thing right at the moment! Shopping, French Bureaucracy , and more "stuff"
Friday was our "Confronting French Government Day", something neither of us was particularly looking forwards to. 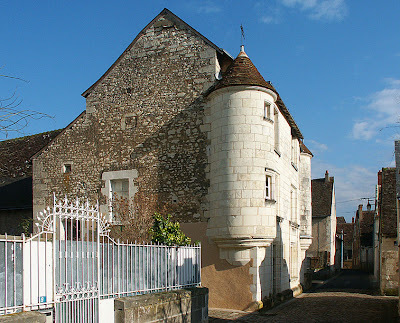 We had to take all the paperwork for the car to the sous-prefecture in Loches to change the car into our name. After driving around a bit looking for the office (it was almost hidden) we fronted with all our various bits of paper to a young woman who took it all, then started shaking her head and tutting. We had the receipt that showed that the dealer had sold the car to us - we didn't have a piece of paper saying the previous owner had sold the car to the dealer. This was a problem, as everything must be done by the book - the French take proof of ownership terribly seriously. An added complication is that you only have 1 month from the date of sale - and our month is up in a week. I rang the dealer who sold the car to us. He speaks French really well, so he was able to communicate with the lady with the stamp really a lot better than we were. After handing the phone back to me we agreed that I would email the previous ownership papers to the dealer, who would find a form showing the previous owner had sold the car to them. Our second task of the day was buying bicycles. LeClerc (the supermarche) had mens and womens bikes advertised for 60Euros. This seemed like a bargain to us, but unfortunately we weren't the only people thinking that way and they were sold out. As it was by now almost lunchtime, we took a minute or two (about 30, actually) to have a plat du jour of sea bass in a mustard sauce and a pot of wine. A very nice - but quick - meal for just under 20 Euros. This slightly numbed the worry of the transfer, and fortified us for dealing with the internet in French. 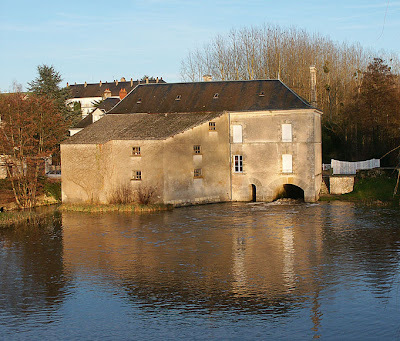 Most of the libraries in Indre et Loire have public internet access. We paid for an hour, the lady scanned our document and we sent it off to the dealer. We rang to say it was sent, and were told it would be done as soon as possible. We waited the hour, but no reply. Susan rang again and we were assured that it would be done before the end of the day and he would phone when it was done. By now I was getting twitchy, and determined the day wouldn't be a complete waste, so we went off looking for cheap bikes. This didnt work, so at about 3.00 we set off home. 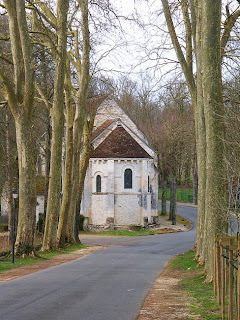 It was lovely weather, so we took a scenic route, finding a really pretty little hamlet called Chanceaux pres Loches, complete with chateau behind a lake, a rushing little stream, and a painted chapel. Tres joli! Thursday was our day for sorting stuff - from visiting M.Galland the roofer, to getting the CT done on the car. M.Galland is an extremely likelable sort of chap. He (and his work) appear to be well respected in and around Preuilly, as everyone seems to know him and has had at least part of their roof repaired by him. 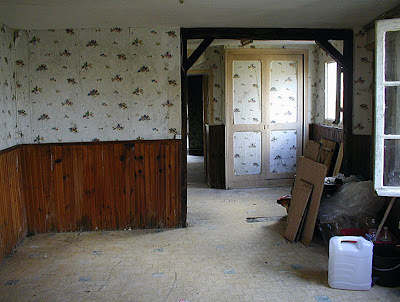 We agreed that he would phone us to have another look at the house so that he could fine tune our slightly (to French eyes) eccentric requirements. We are still undecided about items such as having the chimney (which is the source of most of our ills inside the house itself) demolished and rebuilt. That is to say......the chimney WILL be demolished - it is in the worst possible place as far as a roofer is concerned - whether we have a replacement metal (but looking like stonework) one installed will depend on price. We will need a chimney for our wood burning fireplace, so my instinct is to go for a it (depending on price, naturally). After leaving M.Galland's yard in Yzeures we drove to the Intermarche to shop for the week. As we were driving through the marketplace, however, we saw that they had a market visiting from the Vienne market association (the Vienne is the next Department to ours, literally just over the river Gartempe). We bought most of our requirements for the week in the market - some lovely salad, veg for doing mash (celeriac, swede and leeks), a nice bit of "lieu noir" (blackfish? *) and various bits of meat. All we then needed from the supermarket were some more store cupboard items like pasta and rice. On returning to Preuilly we called in at Bertucelli, our local plumbing superstars. They are one of Europe's largest geothermal heating installers as well as being a general plumber, quite amazing that they are based in Preuilly. (At this stage, I must have been getting pretty stressed by having to do all the fancy communication in Foreign and my overworked synapses failed to connect to anything at all resulting in complete language meltdown - very embarrassing. Susan). We arranged for them to call at the house on Monday afternoon to quote for (initially) installing a toilet and a couple of cold taps, and then the rest of the plumbing including heating. We already have a toilet we haven't been game to try and some other plumbing in the house, so maybe the initial cost wont be too high. It would be nice not to have to rush to the Mairie every time we need a wee! A quick call into our local Renault dealer soon had that problem sorted. 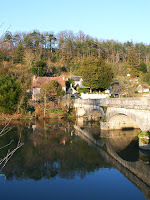 We returned to the gite via the river to have a look at some different views of our new home town. 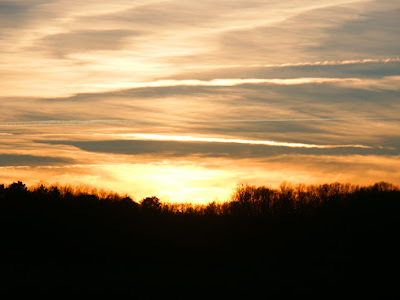 It was amazing weather for February. The daffodils are out, plum (or maybe almond) trees are in blossom. Quite stunning, and so peaceful. We feel lucky that we will be living in such an attractive part of the world. 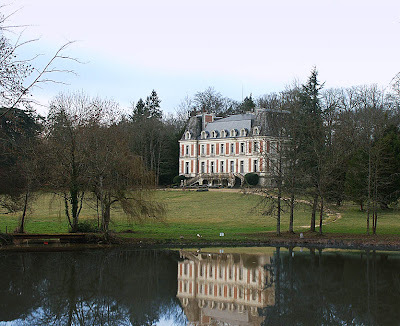 Having bought a French car, we have to do the transfer of ownership in France, so we are spending a week in Preuilly to sort this out and to see M. Galland about his quote for the roof and also to spend some time working on the house. I phoned Mme Fouchecourt to book the gite we had at Christmas time as it is reasonably priced and convenient to Preuilly. After some to-ing and fro-ing in broken French and equally broken English from both parties, we negotiated a deal for a Wednesday to Wednesday rental for 200Euro. As we were to be in Preuilly on a flying visit (Saturday to Sunday) a few days after I spoke to Madame, I also composed a note to Celine, her neighbour, who looks after the gite. We dropped this off in her letterbox on the Saturday so she knew to expect us. 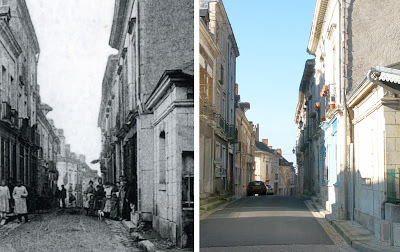 Mme Fouchicourt rarely puts in an appearance in Roux, the hamlet where the gite is situated - she stays with her son in La Rochelle, we are told, by Celine (at her usual million miles an hour French) because she does not like the cold. Certainly at Christmas time it was cold, and spectacular with it, but now, in February, it is just rather damp and relatively mild if overcast, or if clear, back to its usual picture postcard appearance. Except for the bare branches on the trees, you would not be able to tell the season from a photograph. I had also phoned the Norisko garage at La Roche Posay to book the car in for its CT (controle technique) - a vital prelude to the change of ownership procedure the next day at the Sous-Prefecture in Loches. The mechanic did not seem in the least phased by being phoned by someone who clearly had the level of French comprehension of a two year old, but he, like Celine, was also clearly incapable of speaking slowly. All this speaking in French on the phone takes considerable preparation. First, I have to buy a phone card from the convenience store round the corner from work. Then I have to write myself out a script - what I am going to say, with alternatives for the possible different responses. Then, in an open office, in full earshot of my colleagues at work, I have to phone. These calls are rated on the number of times I have to say "repetez s'il vous plait" and how many times I slip into English. Fortunately, our new Director, who started at the beginning of February, seems to be taking this distraction to the working day in his stride. Having a car of our own means we can load up with all sorts of things, from way more clothes than we need for the trip, to camping gear, to field guides. 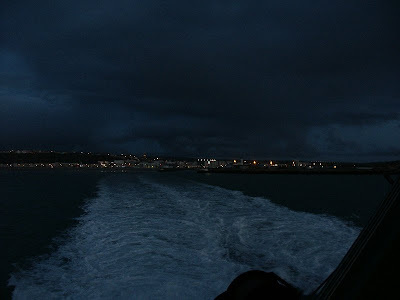 We pack the car the night before, and leave at 5.30 am, to catch the Speed Ferry from Dover to Bologne. This all seems to work remarkably smoothly, and Simon does not find driving a lhd on the left too traumatic and I do not find being a passenger is any more scary than normal. Simon is an extremely good driver - by his own standards of course, being a bloke, but I am happy to say, also by my extremely nervous standards. 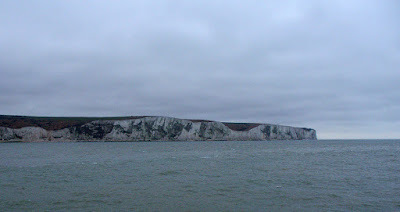 After manoeuvring into position on the ferry we immediately headed for the railing to watch the White Cliffs recede and keep an eye out for porpoises and sea birds. We did briefly venture into the lounge, but it was so stifling, that we spent the whole fifty minute journey out on deck in the wind and spray. We were rewarded by lots of hurrying scurrying guilllemots, who fly in little strung out groups, just above the water. Once, we glimpsed what may have been the plump body of a porpoise just under the surface, dark and football shaped. Best of all though were the gannets hanging on the air, languidly, with their snow white bodies and just the tips of their wings jet black and downward pointing. They were such a treat, and I had not realised that we might see them at all. They are so astonishingly graceful and such a pleasure to see - the sort of wildlife experience which reinforces one's commitment to conservation and the idea that the loss or disruption of such species diminishes everyone's world. Simon had printed off instructions and a map of Bologne, so that exiting the ferry terminus and finding the motorway should have been smooth and simple. Huh! The instructions and map may have reflect reality but failed to meet with our need to find a cash machine so we had enough euros for the tolls. We found a LeClerc (hypermarket) which met our need for money and breakfast, and then it was a simple matter of following the signs to the Autoroute.. Apart from the slow (and circuitous) start, and a very poor snack near Rouen, the trip was uneventful but faintly attractive. All up we were 11 and a half hours on the road, including stops and impromptu "scenic diversions". When we arrived in Roux, we were told, to our surprise, that Madame will be here on Friday and Saturday, so we will meet her. While I started on preparing tea (salad, folllowed by sausages and veg), Simon took a quick trip to Preuilly to unload the stuff we had bought over and pick up our trunk full of clothing. 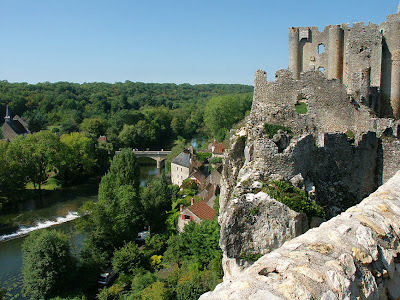 Travelling to France by car is a lot easier - and more interesting - than we had catastrophised about, and will be our route of choice for all but the quickest trips. After having made contact with the builder at Christmas, we though we would keep the pressure on by visiting again fairly quickly. As we now have a car we decided we would drive to Stansted airport, relieving Pat and Geoff of the responsibily for mobilising ground forces at the London end. Thus, 4.00am on Saturday saw us driving the M25 in our new, comfortable, car. We arrived at Poitiers at 9.00, picked up the hire car (a Renault Clio this week) and by 9.20 were in Castorama, the hardware store on the southern outskirts of town, before heading to Preuilly. We stopped at Bonneuil-Matours to inspect the Saturday marche (quite good) and buy a mid morning snack, then hot-footed it to Preuilly to visit the bank. The reason for the bank visit was quite simple - we had ordered a cheque book at Christmas and it had never arrived in the post. The reason for this became obvious when the guy at bank took it out of the drawer behind the counter. This was strange, as we agreed that we HAD asked the bank to post it to us, and thought that request had been understood. We dropped the signed quote for the roofworks back with M.Galland (I had written his phone number down wrong, so we couldnt arrange to meet) and then spent the rest of the day trying to get into the house as the door jamb had moved slightly, and we couldn't unlock the door. This meant a climb up 3 metres of stone wall to enter the barn, then a 3 metre drop the other side. Luckily, I still have some of my Captain Action skills left, which surprised me almost as much as it surprised Susan. The rest of the weekend was taken up consolidating the work we had done in the garden (and finding another cobbled courtyard surface in the process)and walking Preuilly with the book of old photos, taking modern equivalents. Amazingly, little has changed! 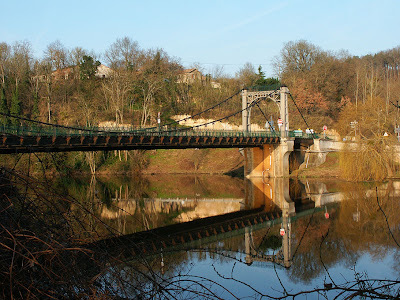 We left after lunchtime (having had a salad and glass of red wine at l'Image) and took photos of the late winter colours of the Claise/Gartempe/Vienne river valleys on our way back to Poitiers. This was quite a fun little trip, with 2 days away, and back in London in time for Sunday dinner.